DETROIT July 13, 2015– Contracts between the UAW and the Big Three automakers expire on September 14, which gives the union and management of Ford, General Motors and Fiat Chrysler two months to hammer out new four-year agreements. 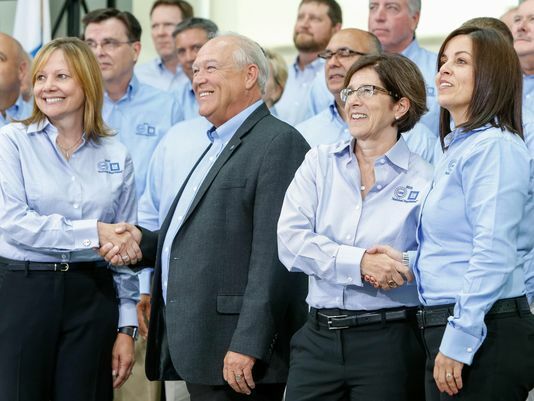 The negotiations kicked off today with GM, with the Chrysler team launching their bargaining process tomorrow, and the Ford team heading to the table on July 23. Top officials from the UAW and General Motors were all smiles Monday as they officially kicked off contract talks and promised to work together even as sharp differences percolate just beneath the surface. UAW President Dennis Williams noted that entry level workers hired under two-tier wage structure adopted in 2007 do not earn enough to be considered “middle class in the way they should be,” and reiterated the UAW’s goal to close the pay gap with those hired before 2007. For those hired after 2007 (the Tier 2 workers), the 2011 contract lifted their hourly pay from $15.78 to $19.28. Those hired before 2007 are still making $28.50, if they work on the line, and about $33 if they are in skilled trades such as electricians, pipe fitters or carpenters. The two-tier system itself has come under added scrutiny because of how different companies have taken advantage of it. G.M. and Fiat Chrysler have had unlimited freedom to hire lower-paid workers because of agreements struck by the companies and the union with the Obama administration as part of their government bailouts. Ford, which did not go bankrupt or require a bailout, is required by its U.A.W. contract to begin bumping new workers up to the higher pay grade when lower-tier employees make up 25 percent of its overall work force. G.M.’s percentage of lower-paid workers is about 20 percent. By contrast, more than 40 percent of Fiat Chrysler’s American employees are entry-level workers. This year marks the first time since 2007 that the union will have the right to strike if an agreement can’t be reached. In exchange for the government bailout in 2009, UAW leadership agreed to binding arbitration if agreements couldn’t be reached with any of the three automakers. That provision expires with the collective bargaining agreements on Sept. 14. This entry was posted on July 13, 2015 by WMALC in Michigan labor news and tagged bargaining, Detroit, skilled trades, trade, UAW, wages, Wayne.